As some readers know, for many years I worked as a professional juggler. It all started with my parents, who were also jugglers. I grew up working in the family juggling act and then after college went on for the next fifteen years as a juggler/show manager for touring theatrical productions. That all ended around 1990 when I settled into a regular job so to speak. Occasionally my juggling skills would come into play since I was still in a theatrically related business in the Los Angeles area. Any juggling would have been for impromptu demonstrations of equipment we sold or just for fun. I haven't juggled at any length for quite some time, but I still have plenty of juggling props just in case the urge ever hits. I should probably go to one of the busking places in my area and try to juggle for tips to make extra money. Hmmm--nah, I'm not sure about that gig. Over the years I acquired several books, magazines, and other items that are good additions to my little juggling research library. Before my mother died she gave me books that had been my father's. The juggling books would probably be among the last of my books to go if I were to start clearing out my shelves. They're not especially interesting to read for the most part (though some have pictures), but they might be considered among my more curious collectibles. Keepers for now. Then there is the Juggling Jackson Gallery of Wall Art--and I use the term very loosely. I have an array of old juggling photos given to my parents over the years. For years those hung on the walls of whatever room in our house we practiced juggling. Also there's the collection of dime-store framed prints of clowns--most who are juggling--that hung all around the house. If something had to do with juggling or reminded my father of juggling then he'd buy it. We got rid of most of the family props by sending them a juggling museum that I wrote about on my memoir blog. Still I have quite a number of props and other fun items mostly stored away in my garage or closets. This is a collection for which I wish I had a special room set aside. I guess for now I'll just dream about that room and hang on to these personal treasures. It's not clutter to my eyes and it's not junk either. Are there any tools of your trade that you have hung on to? Have you ever bought a how-to book even though you already knew how to and just wanted the book because you liked the topic? Do you have a special room in your house that is focused on some certain theme? 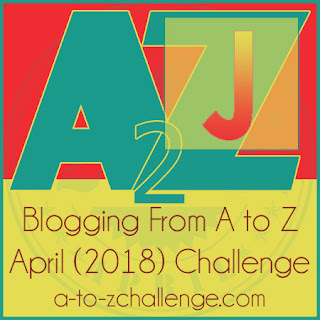 Just caught up with your A to Z posts, Lee. I have found them all interesting. There is a lot of truth in the expression, A rolling stone gathers no moss. People, who relocate frequently, collect fewer possessions than those, who remain in one place for a long time. We have a lot of charity shops in the UK for selling second-hand (used) items or unwanted gifts. I have actually been to a district garage sale in the US and found it very interesting.Sorry if this comment would fit better on one of your earlier posts. Sue, I guess any good comment works on any post. Thanks for stopping by. You need to get a special curio cabinet to hold some of those props for display. Or 2. L.Diane, that would be nice if I had the space, but right now I'm not sure where I'd put a display case. Oh My Goodness! Now that came out of the blue. What a fascinating past and yes, I absolutely concur, those must be the last things you get rid of. Debs, my whole life has been in and out of the blue. Cathy, juggling objects or life comes more naturally once you get the hang of it. How interesting! I grew up in a singing family... we sang folk songs and my parents were in the big choruses singing bach and mozart. I know the words to dozens of folk songs... no tv helped with that! Katherine, singing as a family would be cool. I was always afraid to sing until I became an adult. I only wish I knew how to juggle. Professional jugglers make it look so easy and effortless, even when they're juggling fire. I've definitely got books I haven't particularly needed, but which go along with my interests, like foreign language dictionaries. There's also a book about writing and publishing children's books in the 1990s, whose advice became so dated, the editor who wrote it put out an updated edition about ten years later. It's still interesting to have around. Carrie-Anne, practice makes perfect as they say. I never practiced much and believe me I was far from perfect. I have some weird outdated books about show biz, magic, etc. The text just sounds funny to me, but it's entertaining to read. So you do indeed juggle more than words! This is a fascinating peek into a world that intrigues me. I often dream of juggling (in the forest no less), and my husband can juggle a bit, but it's a clear not-happening thing for me. When I switched careers - I was a therapist - I donated my library. And I have to say it was like a weight was lifted from me. Not that I didn't thoroughly love my job, but it felt like I was set free to pursue something entirely different. It was such an unexpected reaction, and yet utterly perfect. Deborah, I have such a difficult time getting rid of books. Diedre, your office sounds a bit like my office. What an entertaining collection and talent you have. Some possessions we should hang on to. I come from a musical family that includes everyone and I mean everyone except my mom and me. I have (had) four sisters (still have all four sisters) and five brothers. Only one brother is still alive. All my sisters sing, so did all my brothers and most played guitar, violin , banjo, my dad sang and played the harmonica. We had our own little bands and ho-down - throw downs. I suppose I got my talent from my mom. Neither of us can sing or Carry a tune or dance. We have stage presence and don’t mind making a fool of ourselves. Usually someone hands us spoons and sits us in the corner -lol. I wish the talent didn’t skip me. I’ve always envied my sisters and brothers and now all the grandkids as well have it. Melissa, it's weird how certain people seem to take naturally to a skill. We each have our talents. Is it true you can teach yourself to juggle? John, well somebody invented juggling so that would have been self-taught. To learn to juggle properly it's best to have someone demonstrate or study a diagram from a how-to book. Once a person gets how it's done then they just have to practice for hours. LOL... hasn't any kid thought about and tried to juggle and you actually did it! Must have been fun in your house when they said, hey catch this! I can relate to holding onto things, just because. Enjoyed learning that you know how to juggle. Jeanne, the juggling life had its fun moments, but we also put in a lot of practice under the stern leadership of my father. I have a craft room that's dedicated to crafts. lol Juggling seems so hard to me! Did you ever teach your kids? JoJo, all of my kids have learned to juggle three balls at least. My oldest daughter can even do some more advanced club juggling. The only thing left from my first career are my scissors, I was a hairdresser. From my last career I have some things I won in sales contests, I sold furniture. I save leftover yarn from my crocheting projects, it eventually all gets used. I remember your post about your juggling family. Very interesting. The only thing my family juggled was arguments. Patricia, if something is commonly useful in any household then it makes sense to keep it. My family sometimes juggled arguments while actually juggling objects. An angry juggler can be lethal. How fun! My son and husband can juggle but not me. No coordination for that stuff. Janet, some people were surprised when I finally learned to juggle at about age 10. I was kind of an awkward dork. Archana, you never know when old tools of the trade will find a future use. Your history is fascinating, Arlee. I don't really have anything like that in my history. Very cool to have been a professional juggler. Emily, I didn't have a whole lot of choice about the juggling if I wanted to be part of the fun the rest of the family was having with it. I'm glad I did it. A good one for "J". Lee. I recall in the early days you mentioned your expertise of juggling. Yvonne, I won't declare any "expertise" at juggling, but I got paid to do it. Mike, I have a few instruments that I very rarely play anymore. I keep meaning to though. Facinating! I always love to hear about what bloggers are doing when not blogging! I still have reproducible books with pages inked for a mimeograph machine from when I taught school in the early 1980s. They are in the basement at my parents' house. An aside: I used to live in Nashville and heard of Blount County but didn't know where it was, so I looked it up and found it was where my brother goes from KC every summer for mandolin camp. That's completely irrelevant to your post, though.